MEPs were warned that the European Commission's current proposal for a revised EU Transparency Register would allow for even less scrutiny than the existing one, and that to champion greater transparency across all EU institutions, they must start with their own house first. A few weeks before Commission, Parliament and Council are expected to start negotiating a revision of the joint EU Transparency Register, the Alliance for Lobby Transparency and Ethics Regulation (ALTER-EU), Civil Society Europe and Transparency International EU brought together a broad civil society coalition to make key demands that will ensure meaningful reform. Read the open letter in full and consult the list of all signatories here. Consult the current Commission proposal for the inter-institutional agreement here. The inter-institutional agreement process for a reformed EU lobby transparency register should be the first, essential step in a much longer process to make EU policy-making far more transparent, tackle excessive corporate influence, and bring the EU institutions closer to citizens. 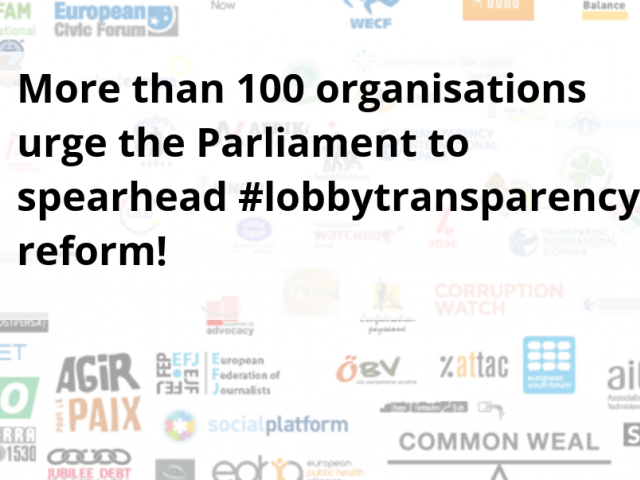 Lobby transparency is an important tool in the fight for public-interest decision making at the European level. A comprehensive lobby transparency register must therefore cover both direct and indirect forms of lobbying to provide accurate information about the actors influencing EU decision-making on behalf of whom, with which budget and on which issues.